Prime Minister Narendra Modi, or “NaMo” as his admirers fondly call him, knows how to market himself. Just the fact that he has a hip moniker like NaMo, and that those voting for him call themselves “Modified”, point to the merging of the modernity of new media with the popularity of the right-wing in India. On October 12, Marathi news channels in Maharashtra skipped their regular news broadcasts for something that would generate them more revenue as well as views. Four channels- IBN Lokmat, Lemon News, TV9 Marathi and Jai Maharashtra, telecast Modi’s Madison Square Garden speech in New York, rather than the 9pm news. The timing of this was crucial, for on October 15, Maharashtra was to vote to choose a new government. The repeat telecast of Modi’s speech, understandably, did go down too well with the Bharatiya Janata Party's (BJP) primary opposition parties: the Congress and Nationalist Congress Party (NCP). These two parties complained to the Election Commission, which hasn’t taken any action yet. But what action can be taken? These are grey areas. And Modi’s professional PR team is filling in the gaps with political advertising, Twitter campaigns and all sort of social media blasts. Narendra Modi, has created a cult around himself, even with the shadow of the massacre of thousands of Muslims under his watch during the Gujarat riots of 2002. But he had the golden touch when it came to the economy and growth. It seems that in national politics across Asia, strong polarizing figures have taken charge. Turkey's Recep Tayyip Erdogan, Sri Lanka's Mahinda Rajapaksa, and Russia's Vladimir Putin are some examples of “democratic” leaders who have made the process work for their right-wing, and often dictatorial ideologies. In March this year Erdogan responded to allegations of corruption by tightening his grip on the media and blocking Twitter. New media is a tool, to bring in political support and push back criticism. Modi is a popular figure, and has become popular in a large part due to social media campaigning during the time of the Indian elections. Modi, even with the politics of image, has never been one to tolerate dissent. His own party members have called him a dictator, that he just gives orders and expects them to be followed. He has walked out of interviews and cancelled appearances, just because he was not told what he would be asked. He loves controlling content and what better way to do it than through social media. In 2009, Modi launched a PR campaign to rehabilitate his image. As Uzra Khan, a journalist from New Delhi puts it; it transformed him “from Massacre Minister into Development Guru”. The company APCO Worldwide was hired by Modi, for approximately $25,000 a month. This helped to publicize his track record for economic growth and created a global network for him, “Friends of Gujarat”, an alliance of like-minded people, especially of the business community. The PR campaign with APCO was discontinued in 2013, because Modi had been so successful in creating a favourable image that he didn’t need a PR company. A senior BJP leader said in Open Magazine in 2013: "Modi does not need either the party or PR agencies; television news media is doing the job for us." The Indian media industry’s has had a slew of recent scandals with journalists giving good press to specific companies and businesses. They call this “paid news”. This is just how business is done in India; it’s all about making a profit. Ethics is not part of the discourse in practical media economics. Thus on March 19, the Times of India, the biggest English newspaper had a full front page advert of Modi, purchased by the BJP. Such easy money meant that the media would change its tune, and it did. A number of magazines and papers changed their stance on Modi, and news channels gave him more coverage than any other candidate. When a corporate firm is not controlling PR, the media easily steps in to fill the vacuum. Social media, after the 2009 campaign by APCO has been self generating, mirroring and reflecting on opinions in the mainstream media. The process of interaction between traditional and social media is seamless due to the advent of new media. Likes on Facebook, are now as good as ticks at on ballot papers. This all points to a number of realisations about the rise of Modi. Firstly, that his image is a constructed one, and is constantly controlled. Secondly, that the integrity of traditional media sources is in jeopardy. “Truth searching” is no match for the risks associated with it. This has caused social media to be the final tool for resistance. While political thugs can shut down a paper, or threaten an editor, they cannot delete a tweet. However, social media and new media technologies in politics are tools. 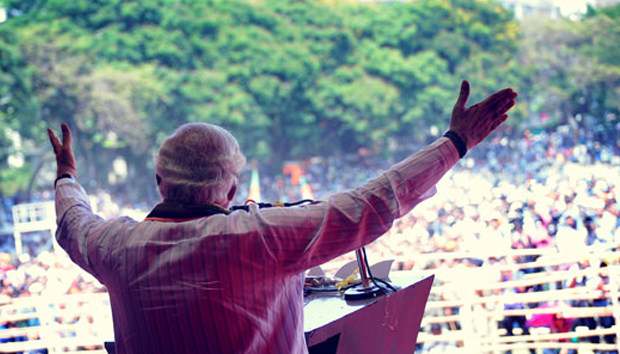 Modi to a large extent established his political image and propaganda when social media use was in its nascent stages. As he was first on the scene, he was first to capitalize on any gains. While the dissenting journalist finds Twitter to be his only “free” space to broadcast, the Modi supporter is there to, to reply back. It is a game like any political game, one of power and persistence.